Fort Christmas had a short existence as forts go-just over two months. Its unusual name, though, continues to draw attention to the East Central Florida town of Christmas, as well as to the nearby replica of the former frontier outpost-especially during the yuletide season. In December of 1835, hostilities broke out across Florida as the Seminole Indians attacked American military and civilian targets from the east coast of Florida to the Tampa Bay area. Throughout the following year, Florida’s Indians experienced a number of battlefield successes as the Second Seminole War heated up. The native uprising was in response to the U.S. Government’s attempt to remove the Indians from their homeland and place them west of the Mississippi in the Arkansas Territory. There they would join the Creek Indians who had been exiled from Alabama and Georgia. General Thomas Jesup was given command of American forces for the Florida campaign in December of 1836 and began to apply pressure on the Indians. By the end of 1837, much of the Seminole force in East Florida had been captured. The next objective was to continue the initiative and force the rest of the Indians southward into a corner. In order to keep his troops in the field, Jesup decided that a new series of temporary forts would be built to function as supply depots for the operation. Toward this end, troops under the command of Major Lomax set out from Fort Mellon, near Lake Monroe, on the 13th of December, 1837. The project was the construction of a supply road south from Lake Jesup. Progress was slow due to the harsh Florida terrain, consisting of dense palmetto, swampy areas, heavy undergrowth, plus numerous biting insects and reptiles. Waterways provided another obstacle and bridges had to be built, including one of fifty feet over the Econlochatchee River, east of what is now Orlando. On December 25, the American force reached an Indian village called Powell’s Town, located on the edge of a stream. Powell was the English name for Oceola, a principal chief of the Seminoles who had been captured two months earlier under a flag of truce. Two days later a fort was completed across from the village and named Fort Christmas. The dimensions were eighty feet on each side with two blockhouses twenty feet on each side. They were placed diagonally across from each other. Members of the garrison enjoyed a peaceful tour of duty. And patrols, sent out to search for Indians in the vicinity, made few contacts and did not engage in combat. Fort Christmas carried everything necessary to keep an army operational. In addition to food, clothes and weapons, the long list included items from gimlets, needles, hammers and saws to saddles, horseshoes and axes. When Fort Taylor was constructed farther south near Lake Poinsett (west of Rockledge) on January 6, 1838, Fort Christmas declined in importance but continued to operate as a depot. On March 3, 1838, the fort was ordered closed after its stint of active duty. Neglect and the forces of nature eventually caused the outpost to return to its origin in the Florida soil. 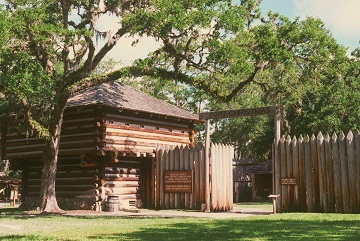 Today, guided tours of the fort and museum (located in both blockhouses) provide a look at life during the Seminole Wars. Among the items displayed are artifacts from the three Indian conflicts, farm equipment, household furnishings and a picture gallery of settlers. Over the years the Fort Christmas Historical Park has brought in local turn-of -the-century “cracker” houses to an area south of the fort. 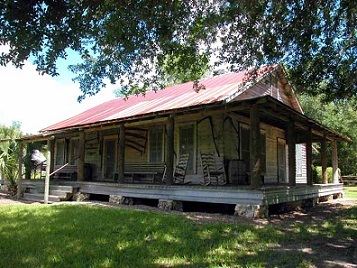 This settlement consists of real homes, like the John Yates House (1890s) and the Wheeler-Bass House (1915), which started out as a barn but was enlarged over the years to handle larger families. Recently a school house was added. All buildings have been refurbished and furnished with authentic items from that era. Facing trouble while installing the mega box hd application. Then to help you out i have provided guide. By reading the procedure do the mentioned steps in a step wise manner.A partial list includes: a buckboard, farm implements, dining rooms with utensils, stoves, photos on the wall, and porches with rockers. All that’s missing are the original inhabitants. And the list of structures continues to grow. 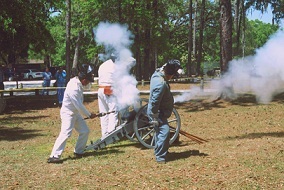 There are special events scheduled at the fort throughout the year. They include: Cowboy Reunion, Militia Encampments with cannon and musket fire, Bluegrass and Craft Festival, Old Timer’s Day, Pioneer Homecoming Day, and a Cracker Christmas. And in December, interest in Fort Christmas picks up as residents from Central Florida drive to Christmas to have their cards and letters postmarked. For complete information on anything you want to know about the fort and a virtual tour, visit their site. The number to call is (407) 568-4149. A great place to visit and learn.